Next week I head to Missouri and Illinois for three days of three readings, the first at Southeast Missouri State University in Cape Girardeau, Wednesday, October 21, 7 – 8 p.m. in Crisp Auditorium. When I think of growing up near Cape, I think of doctors and Christmas shopping, Buchheit’s in Biehle, the Missouri Synod, Bollinger Mill and Bollinger County. My grandmother was a Bollinger after all, from the Illinois side of the family. I’ve never been to SEMO. The Cape Rock was one of the first journals to publish my writing in 1994. The press at SEMO started in 2001. The book prize awarded to Underwater Panther was brand new when I submitted in 2014. The social and cultural capital of an area is key to its future, and I’m thankful to be a small part of the good work that SEMO is doing. Activities planned for October 21 include meeting with a creative writing class, the reading with Q&A and book signing, and visiting with students in SEMO’s English Department. All this is due to the work and hospitality of Susan Swartwout, the press’s publisher and editor, and the support of the Missouri Arts Council. I look forward to meeting Susan and thanking her and assistant editor Carrie Walker in person. If you’re looking for a press, you should consider SEMO and its variety of contests, and as poets, in particular, the Cowles Poetry Book Prize: the press has been able to increase the amount of the award from $1000 to $2000, plus 30 book copies for the author. The next deadline is April 1, so you have time. Growing up near Cape, I never dared dream that my writing would be valued there. I am humbled to have the opportunity to return now. This entry was posted in publications, readings and tagged Bollinger Mill, Cowles Poetry Book Prize, Missouri Arts Council, SEMO, The Cape Rock, Underwater Panther on October 14, 2015 by Angie Macri. 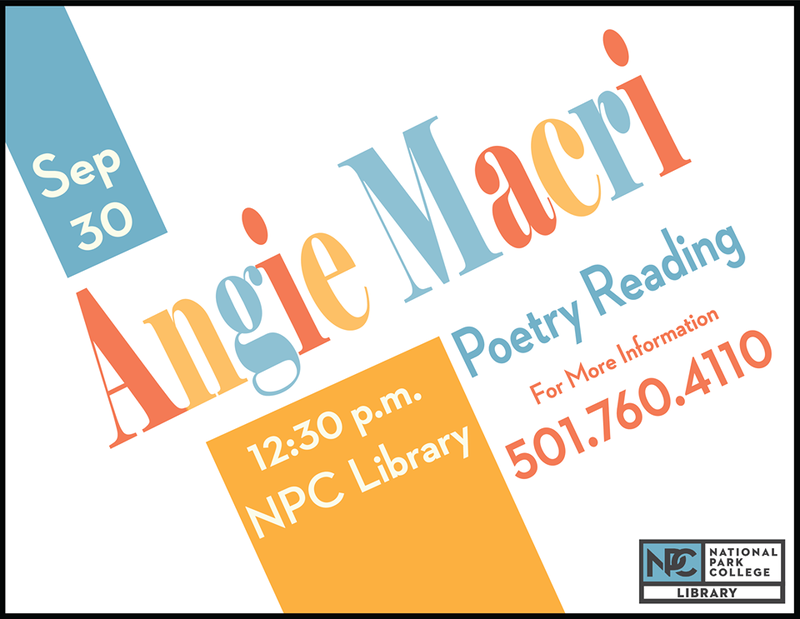 This entry was posted in readings and tagged Cape Girardeau, poetry, SEMO on August 11, 2015 by Angie Macri.